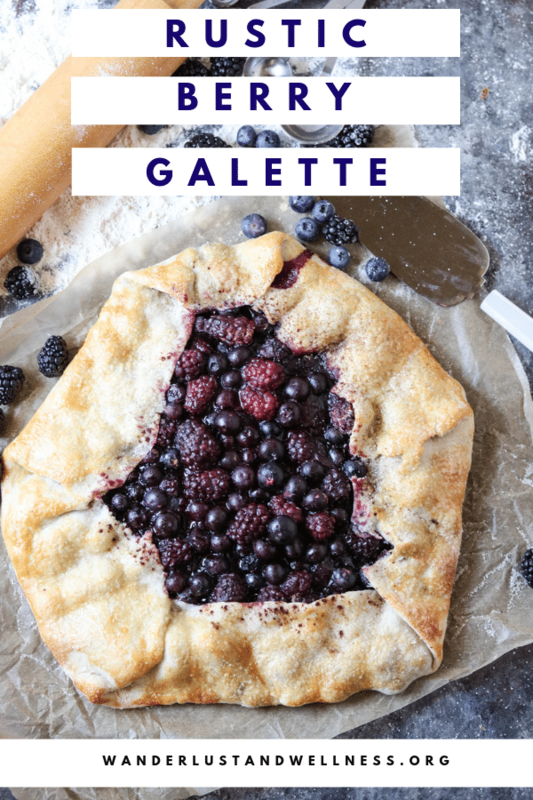 This rustic berry galette is super easy to make, which is why I love baking gluten-free galettes! No technical pie making skills required – so there’s no excuse to not get your bake on with any of these gluten-free galette recipes. This gluten-free crust recipe is seriously so easy. Plus, if you’d like a step-by-step walk-through with pictures, just check out my gluten-free galette dough recipe tutorial. It’s the same recipe I use in almost all of my pie crust galettes, but this tutorial will walk you through step-by step with pictures! If you’re a visual learner like me, this is for you! Galettes are intended to have a rustic feel to them, so perfection is not needed with this dessert. I used to watch my mother and grandmother labor over intricate pie crusts, which always seemed impossible. When I started baking on my own, I was introduced to gluten-free galettes, and now they’re my quick, go-to “pie” dessert. And look at those plump berries. Swoon! So juicy and full of summer flavors. 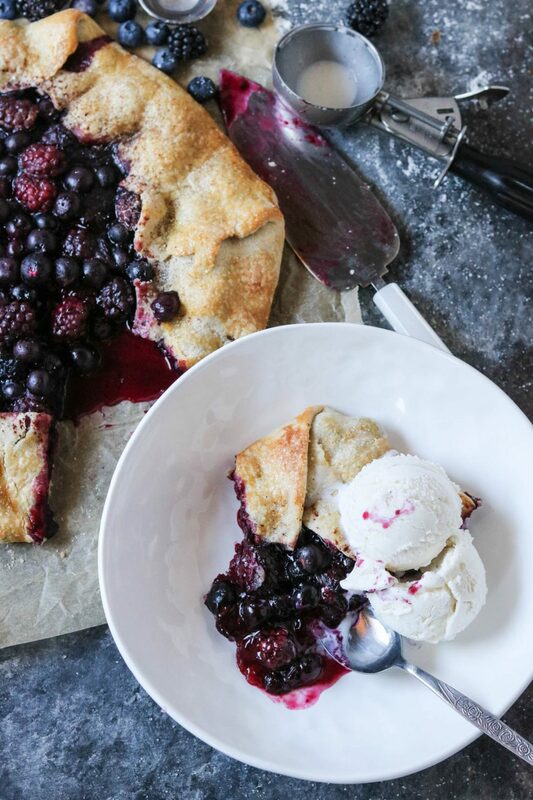 Serve this gluten-free rustic berry galette with vanilla ice cream, and you’ll have a swoon-worthy dessert. I whipped this dessert up for a recent outdoor BBQ, and it was the perfect addition. Memorial Day, 4th of July, summer BBQs, whatever the event may be, this galette will feed a crowd, and you’ll look like a fancy baker, win-win, right?? Of course, you can also enjoy this any time of year if you have access to fresh berries. How to make a rustic berry galette. Time needed: 1 hour and 10 minutes. Add your crust ingredients to a large mixing bowl. In a large mixing bowl, combine flour, sugar, and salt. Cut butter into cubes and add to flour mixture. Using a pastry blender or fork, cut in the butter into the flour mixture until you have coarse crumbs. Press the dough into a ball or disc, wrap with plastic wrap or in a towel, and refrigerate for 20 minutes. For a full tutorial – check out my gluten-free galette dough recipe. While the dough is chilling, add the berry filling ingredients to a large mixing bowl and stir together. Set aside until dough is ready. When the dough is ready, lay out one sheet of parchment paper and flour lightly. Add dough to floured surface. Then cover the dough with an additional sheet of parchment paper and roll out into a large 12-14 inch circle. Spoon filling into the center of the dough, then carefully fold up the edges, letting them naturally fold in. Carefully transfer the dough, parchment paper and all, to the lined baking sheet. It’s okay if the dough breaks or cracks – just simply pinch together. Trim the parchment paper so that none hangs over the edge of the baking sheet. In a small bowl, whisk the one egg white and brush over the crust edges. Sprinkle additional sugar across the entire galette and place in the oven to bake. Bake for 30 minutes, then remove from oven and let slightly cool before serving. Serve with vanilla ice cream if preferred. Can I freeze the rustic berry galette prior to baking? I would suggest freezing the dough ahead of time if needed, but not the entire galette. The tightly wrapped dough can be frozen for 2-3 weeks. When you’re ready to bake the galette, remove the dough from the freezer and let soften at room temperature – then proceed with making your rustic berry galette. What is the difference between a galette and a tart? A galette is a free-form, rustic dessert made with rough-edged dough that is folded up around the filling, where a tart is normally pressed into a tart pan. No – only galettes made with a gluten-free flour or flour blend would be considered gluten-free. Enjoy these other summer inspired gluten-free recipes with your rustic berry galette! 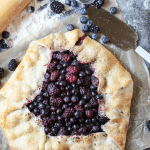 This Rustic Berry Galette is gluten-free and is the perfect summertime dessert! Pair it with vanilla ice cream and you’ll have a delicious gluten-free dessert. In a large mixing bowl, combine flour, sugar, and salt. Cut butter into cubes and add to flour mixture. Using a pastry blender or fork, cut the butter into the flour mixture until you have coarse crumbs. Carefully transfer the dough, parchment paper and all, to a baking sheet. Trim the edges of the parchment paper so that none is hanging over the edges. In a small bowl, whisk the one egg white and brush over the crust edges. Sprinkle additional sugar across the entire galette and place in the oven to bake. Bake for 30 minutes, then remove from oven and let slightly cool before serving. Serve with vanilla ice cream if preferred.